If you’d like to become healthier, more flexible and lose weight, but hate treadmills or going to the gym, swimming is just what you’ve been looking for. Many people put in a pool primarily for their health. Not only that, swimming is suitable for people of all ages. When you’re done exercising, call a couple friends over for a pool party (can’t do that with a treadmill!). Frequent swimmers use muscles throughout their body, unlike runners who primarily develop the leg muscles. As you practice in your pool, you’ll be strengthening muscles in your legs as you kick and in your arms as you pull through the water. Your stomach will tighten as your back stretches and rotates. Your pool offers a total aerobic body workout. Don’t forget, your heart is also a muscle. The cardiovascular benefits of exercising in a pool are very important. It’s been long believed that bone mass could only be increased with weight-bearing exercises. However, the Journal of Applied Physiology published research comparing three groups: runners, swimmers and those who did no exercising. Runners did, as expected, show the highest increase in bone mineral density, but the swimmers also experienced positive results. Stretching is critical in any exercise program. When you work out in the pool, you are constantly stretching, reaching, pulling and twisting all parts of your body. In addition to the cardiovascular benefits, aerobic activities are great for reducing the inflammation linked to atherosclerosis buildup in the heart. There’s a lot of focus on reducing inflammation in joints and other parts of the body with special diets and medications. 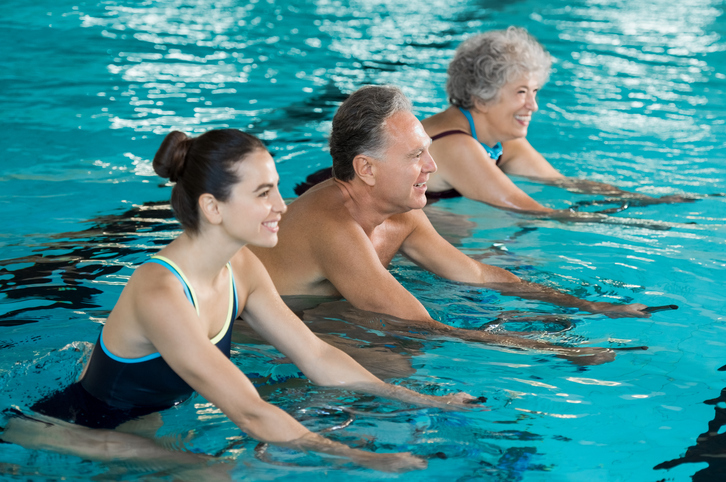 Exercising in water can become an important part of your overall health regimen. So if you really want to lose weight, jump in your pool. A strong 30-minute session doing the butterfly stroke will burn 150 more calories than running a 5K in 30 minutes. Breathing the moist air while working out in a pool can be very helpful for those with asthma. The dry air found in a gym make fitness hard to achieve. A study of a group of asthmatic children found that a six-week swimming program reduced the severity of symptoms, snoring, mouth-breathing and visits to the hospital and ER. One year later, researchers noted the children were still doing better. Swimmers are taught good breathing techniques and can experience improved overall lung volume. There’s nothing better than coming home from a hard day and jumping in your pool. Exercising releases natural endorphins that relieve stress and depression, whether you’re in your pool or running. After a session, you’ll feel relaxed. Some swimmers report feeling a relaxation rush unique to this activity. Doing laps can become a calm, meditative experience as you focus and ignore other distractions and problems. Doing so naturally lowers both stress and depression. Researchers studying ways to help those with brain damage have found that stress reduction from aerobic exercise can be beneficial. Those who regularly swim in the ocean notice that their skin gradually improves, looking better and better. Pool Troopers salt chlorine generator can provide the same benefits in your pool. Saltwater chemistry aids the skin in moisture retention and new cell growth. You’ll love your smoother, healthier skin. Australian researchers compared children who were regular swimmers to non-swimmers. The study found the swimmers had improved confidence, language development, physical development and fine motor skills. Swimmers might even be helped with math since they may be frequently calculating how many meters they swim, comparative times and other stats. At the University of South Carolina, researchers followed a group of 40,547 men of all ages for 32 years. The astonishing conclusion was that the swimmers had a lower death rate, by 50% than those who ran, walked or didn’t exercise. Since people of all ages can enjoy aerobic activities in a pool, this may help explain their conclusion. Please, for your health, find a way to exercise in your pool today! If you’ve been stressed or hate taking care of your pool and the water chemistry, Pool Troopers is an experienced and dependable pool maintenance company. Enjoy improved fitness and fun in your pool without all the maintenance chores. Contact Pool Troopers today !